Dr Moline is a developmental and general paediatrician who undertook 10 years of paediatric training through the Sydney Children’s Hospital Network working in developmental paediatrics, community paediatrics, child protection and general paediatrics. She is a Fellow of the Royal Australasian College of Physicians and a member of the RACP Chapter of Community Child Health. She has a Masters of Public Health and a Masters of Health Management, both from the University of New South Wales. 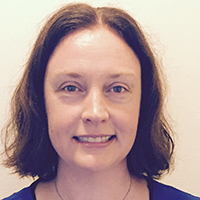 Dr Moline has a further 10 years of specialist experience working in the South Eastern Sydney Local Health District as a Consultant Paediatrician. She has worked extensively with children who have complex developmental and behavioural needs including Developmental and Intellectual Disabilities, Autism Spectrum Disorders and ADHD. In addition, Dr Moline is a passionate advocate for vulnerable populations and has developed specialist multidisciplinary clinics for infants at risk of cerebral palsy due to birth trauma or prematurity; for infants and children born to substance using mothers and for adolescents with eating disorders.